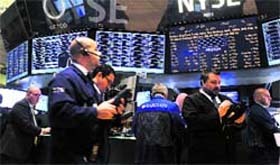 Listed companies will now have to necessarily disclose all price sensitive information, including monthly sales figures, to stock exchanges first, capital markets regulator Securities & Exchange Board of India said on Thursday. US President Barack Obama and Congressional Republicans face even bigger budget battles in the next two months after a hard-fought "fiscal cliff" deal narrowly averted devastating tax increases and spending cuts. The Securities & Exchange Board of India's proposal to tighten share buyback rules, including setting a minimum that must be bought by companies, was welcomed by investors on Thursday who said it would curtail instances of abuses in the process. 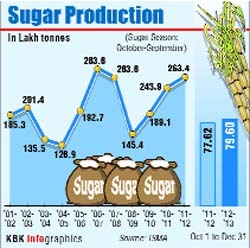 Sugar output rose 2.5% in the first three months of the season beginning Oct 1, 2012. Apex trade body ISMA said production was up 0.2 million tonnes to 7.96 mt until Dec 31, 2013 compared to 7.76 mt by the same time last year. The government has set up a committee to suggest measures to lower high costs of Air India's operations and improve utilization of resources in line with best global practices to help the beleaguered national carrier achieve the goals of turnaround and financial restructuring plans approved in 2012. The Competition Commission of India (CCI) said Thursday it had modified the agreement between the DLF group and apartment buyers in its two real estate projects, wherein DLF was found to have abused its dominant position. Jet Airways said Thursday it was in talks with Abu Dhabi's Etihad Airways for a potential stake sale in the Indian carrier, although terms have not been finalized yet. In a bid to help many power plants operating at low capacity in improving their power generation, the petroleum ministry has allowed flexibility in gas utilisation. The ministry notified the guidelines on Thursday for clubbing or diversion of allocated gas between two or more power plants of the same owner. “All the events or material information which will have a bearing on the performance / operations of the company as well as price sensitive information shall be first disseminated to the bourse as required under Clause 36 of the listing agreement,” SEBI said in a circular. The regulator said it has noticed certain listed companies giving monthly disclosure of their sales/turnover/production figures to their “respective trade bodies” and the same is not disclosed to the bourses. The information considered to be “price sensitive” as per the guidelines include: any change in nature of business, disruptions due to natural calamity, commencement of commercial operations, developments arising out of change in regulatory framework, litigation or disputes having a material impact and revision in credit ratings. SEBI also advised stock exchanges to take into account the requirements of the circular and bring the same to the notice of the listed companies. According to Clause 36 of the listing agreement, listed firms are required to immediately provide information to the bourses concerned of events such as strikes, lock outs, closure on account of power cuts and all events which would have a bearing on the performance as well as prices. This has to be done both at the time of occurrence of the event and subsequently after the cessation of the event, the regulator said. The agreement, approved late on Tuesday by the Republican-led House of Representatives and signed by Obama on Wednesday, was a victory for the president, who had won reelection in November on a promise to address budget woes, partly by raising taxes on the wealthiest Americans. But it set up potentially bruising showdowns over the next two months on spending cuts and an increase in the nation's limit on borrowing. Republicans, angry the fiscal cliff deal did little to curb the federal deficit, promised to use the debt-ceiling debate to win deep spending cuts next time. Republicans believe they will have greater leverage over Democrat Obama when they must consider raising the borrowing limit in February because failure to close a deal could mean a default on US debt or another downgrade in the US credit rating. A similar showdown in 2011 led to a credit downgrade. "Our opportunity here is on the debt ceiling," Republican Senator Pat Toomey of Pennsylvania said on MSNBC. "We Republicans need to be willing to tolerate a temporary, partial government shutdown, which is what that could mean." The capital markets regulator unveiled a series of proposals late on Wednesday, including one that says companies must purchase at least 50% of the announced buyback offer from the current minimum of 25%. SEBI also proposed that the process be completed within three months of the announcement of the offer from the current one year, and suggested companies be barred from raising capital for two years after purchasing its own shares. The capital markets regulator said the measures are meant to crack down on potential abuses as some companies have announced buybacks but did not actually end up doing so, benefitting nonetheless from the ensuing gains in their share price. "The proposed framework by SEBI is good for investors and its chances of implementation are very high as the ultimate benefit of buybacks in many cases was not balanced between promoters and public shareholders," said G. Chokkalingam, chief investment officer at Centrum Wealth Management. In some instances companies ended up buying back shares at prices well below the range provided in the announcement, Chokkalingam added. The five-member committee, headed by IIM, Ahmedabad’s Ravindra H Dholakia was set up by Civil Aviation Minister Ajit Singh after a review meeting of the ailing airline’s functioning. Though the panel has been given two months to submit its report, it has been asked to give interim recommendations without waiting for its final report so that these could be implemented by Air India immediately, an official statement said. The panel would go into the expenses, identify loopholes in the company's existing structure and functioning leading to wasteful expenditure and recommend measures to plug them. It would analyze the utilization of jet fuel which accounts for more than 40% of its total costs, as well as the inventories of spare parts and suggest ways to optimize fuel usage and inventory management. Expressing concern over the projected net shortfall of Rs 404 crore a month, the Minister had recently asked Air India to cut redundant costs and optimally utilize its resources to meet the annual financial projections envisaged in the financial restructuring plan. According the latter, Air India is supposed to be EBITDA positive by the end of the financial year. The apartment buyer agreement has been modified after a direction from the Competition Appellate Tribunal, where DLF had challenged a penalty of Rs 630 crore imposed on it by CCI. CCI said in a statement that “the apartment buyers agreement has been amended such that the abusive and unfair conditions present in the original one-sided agreement have been removed”. The agreement between DLF and apartment allottees has been modified through a supplementary order passed by CCI, it said. The tribunal had asked CCI in March, 2012 to pass an order specifying the extent and manner in which terms and conditions of the apartment buyer’s agreement need to be modified. CCI said the terms of the Agreement has been modified in a manner “which it considers fair and reasonable and takes into account the interest of both parties“. The commission had passed its original order on August 12, 2011 wherein it had held that DLF Ltd was a dominant enterprise and violated the provisions of the Competition Act “by entering into an agreement with apartment allottees that was one sided, abusive and unfair to the allottees”. CCI said the apartment buyers’ agreement had been accordingly amended such that the abusive and unfair conditions present in the original one-sided agreement had been removed. The statement was the first confirmation of a potential deal by either side, a day after an Indian government source said the Gulf carrier could pay up to $330 million for a 24% stake in Jet. Jet shares surged as much as 6.4% on Thursday. "Various structures are being explored by the legal and commercial teams," Jet said in a statement to the BSE, adding any structure would comply with Indian rules. The founder of Jet Airways is likely to convert shares owned by its holding company into his personal stake to comply with foreign investment regulations, a government source had said. Tail Winds Ltd, the Isle of Man-based investment vehicle of Jet founder Naresh Goyal, currently holds 79.99% of Jet Airways.